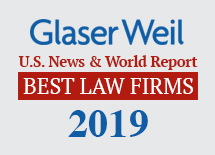 Glaser Weil is pleased to announce it has been included on the U.S. News - Best Lawyers “2019 Best Law Firms” list. Securing places both regionally and nationally, including several “Tier 1” positions. Earning a top-tier ranking is defined as a combination of quality practice and extensive legal expertise. Acknowledgment was made in 75 national practice areas and 122 metropolitan practice areas. Fourteen Glaser Weil attorneys were named to the 2019 Edition of Best Lawyers in America®, which was released earlier in this year.